Rebuilding Place in the Urban Space: Town-city management: "We are all asset managers now"
Town-city management: "We are all asset managers now"
In 2005, I wrote a piece, "Town-City branding or 'We are all destination managers now'" that made the point that commercial district revitalization advocates, stakeholders, and managers needed to think more broadly about their mission, that we should be managing the destination (our "places") in all aspects. Just as the study team believes that “we are all destination managers now,” elected and appointed officials in particular and in association with other community stakeholders serve as a community’s “brand managers”—whether or not they choose to think of their roles in this manner. That means that decision-making on land use and zoning, business issues, infrastructure development (roads, sewers, water, utilities, transit), technology (broadband Internet, etc.) and quality of place factors (arts, culture, historic preservation and heritage, education, public schools and libraries, urban design, etc.) must be consistent and focused on making the right decisions, the decisions that collectively achieve and support the realization of the community’s desired vision and positioning. Something else I read termed this as making "brand deposits" or "brand withdrawals," how the decisions and actions concerning a brand either make positive contributions and build the brand or the actions are negative and diminish the value of the brand, its reputation, aspirational qualities, etc. Since 2010, I have extended these concepts in terms of what I originally called "Signature Streets," but expanding outward from transportation now call it the integrated public realm framework (from David Barth) or the network of civic assets (civic assets network), and recommend that we do integrated and comprehensive planning around public assets as an coordinated system of related and inter-connected facilities, sites, and programs. 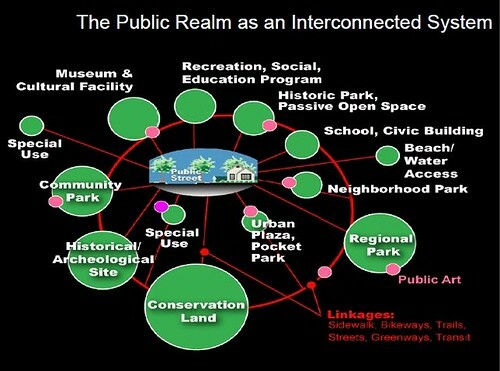 Public Realm as an Interconnected system, Slide from presentation, "Leadership and the Role of Parks and Recreation in the New Economy," David Barth and Carlos Perez, AECOM. * At the very end of the development process for the Western County Pedestrian and Bicycle Access Plan, I came up with a concept that I called "Signature Streets" but I just didn't have the time to develop it more thoroughly or "sell" it adequately to the advisory committee. The basic idea was built upon the realization that the set of primary arterials in a community is the foundation of its mobility network and the aesthetic qualities, positive or negative, shape the perceptions of the community. 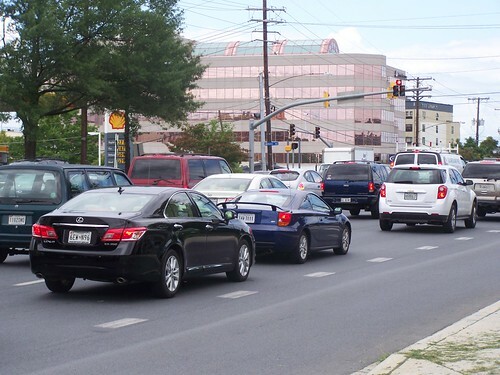 Designs for most arterials do not prioritize aesthetic or place considerations. This is Rockville Pike in Montgomery County, Maryland. Note that the "parkway" road type, typical of the 1920s and 1930s is an exception. The challenge is to balance mobility, commercial, and aesthetic-place priorities in street design, in a land use and transportation planning paradigm that focuses mostly on prioritizing traffic throughput. So why not recognize the primacy of the road network as a key shaper of a community's identity by enhancing the aesthetic qualities of the road network, and by expanding the mobility qualities of the road network to incorporate sustainable mobility. 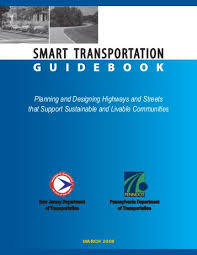 (4) by designating a subset of a community's road network as foundational or "signature"
(7) with all of these elements in combination to support the case for financing using bonds and winning the vote in favor of the bond referendum, therefore raising the funds to pay for the development and enhancement of the upgraded mobility network and acquisition of the necessary right of way. Unfortunately, my concept for an integrated signage system for county civic assets and facilities didn't go over too well. But I attribute that to not having enough time to work through a couple iterations of the concept, to get to a point where people would have become more comfortable with integrated thinking. Graphic design concept by Tim Hampton. 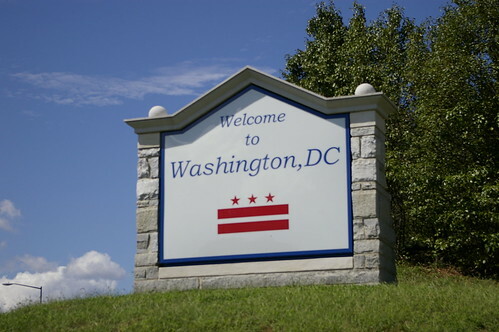 In most communities (not DC), to expand the right of way, you have to buy the land. That's expensive. The government doesn't want to do it. But by positioning "Signature Streets" in terms of extending the road system by adding elements that build a more complete mobility network that enhances quality of life and how the county "deserves" a road-mobility system that meets 21st Century needs, and in keeping with the fact that the County is the third largest jurisdiction in the State of Maryland makes this kind of re-thinking achievable. With regard to bond funding, even in bad times, parks-related bond initiatives pass overwhelming in Baltimore County. And this idea of making roadways a type of "linear park" increases the likelihood of a successful referendum. Street sign topper, Portland, Oregon. Wikipedia photo. 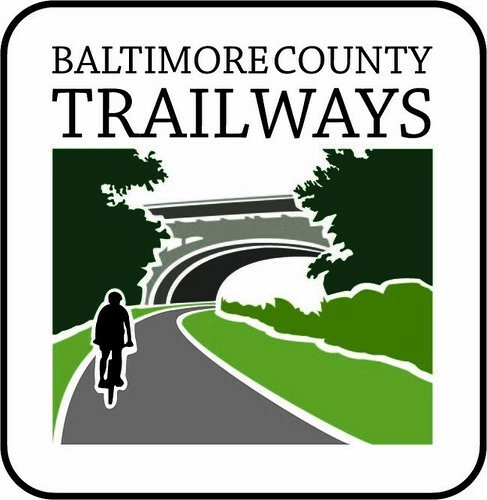 My idea was to have a "Baltimore County Signature Street" sign topper on street signs for the newly defined Signature Streets sustainable mobility network. This week I attended the CG/LA 7th North American Infrastructure Leadership Forum," and I'll be writing a bunch of pieces as a result. One of the thoughts I had in one of the sessions was "we are all asset managers now." The various presentations at the conference convinced me to reconsider my hesitation about P3 or "Public-Private Partnerships," where public assets like roadways and transit systems are financed, built, and operated by the private sector. Because these arrangements are structured by contracts, unlike the typical management and maintenance of similar types of assets by the public sector, P3 entities aren't in a position to let the "state of good repair" slide, because if the contract is written properly, they could lose the asset. It's not that I don't think that governments or other public authorities are capable of investing in or maintaining public assets, but too often that doesn't happen because elected officials and other stakeholders aren't thinking about their roles as a community's "asset managers." Instead, they often choose to postpone funding repair and maintenance that isn't absolutely necessary today, to spend the money on something else. 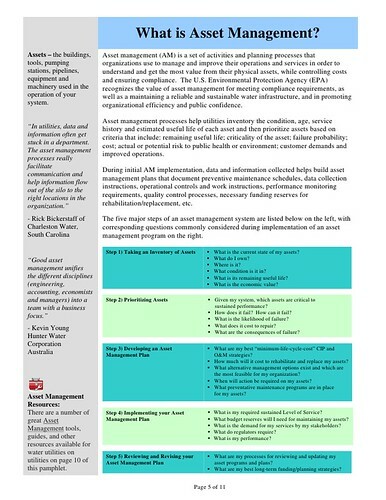 Just as the study team believes that “we are all destination managers now,” elected and appointed officials in particular and in association with other community stakeholders serve not only as a community’s “brand managers,” they also function, either by commission or omission, as a community's "asset managers"—whether or not they choose to think of their roles in this manner. That means that decision-making on land use and zoning, business issues, infrastructure development (roads, sewers, water, utilities, transit), technology (broadband Internet, etc. ), the natural environment (open space, rivers, tree cover, watershed, etc. ), and quality of place factors (arts, culture, historic preservation and heritage, education, public schools and libraries, urban design, etc.) must be consistent and focused on making the right decisions, the decisions that collectively achieve and support the realization of the community’s desired vision and positioning in terms of quality of life/placemaking, economic health, and the stewardship of physical assets and the built and natural environment. Although this building has since been stabilized, for a long time the condition of DC's vacant Alexander Crummell School was worse than deplorable. My joke then was that DC's primary property management strategy was demolition by neglect. Photo by Peter Sefton. Capital budgeting. One way to begin moving toward an acknowledgement of the importance of managing public assets superlatively is to ensure that all public authorities have robust capital improvement planning and budgeting systems. Typically private sector accounting recognizes that physical assets have a long useful life and accounting systems, depreciation rules, and other processes have been created to reflect this in financing, budgeting, management, and in the presentation of balance sheets. By contrast, the fund accounting system used by governments and nonprofits doesn't typically recognize investments over more than a single year period. Costs are expensed in the year that they are paid or when the funds are appropriated. Most governments have dealt with this by creating two budgetary processes, the annual budget, focused on personnel and programs and short term expenditures, and a capital budget, focused on the long term planning and financing of physical assets like buildings and roads. Most local and state governments have formal capital budgeting processes, especially because most use bond financing to fund such projects. This racks up significant interest costs, but spreads the cost of building and funding the acquisition and development of assets over longer periods of times, better corresponding to the term of the asset's useful life, which can be many decades. The Federal Government doesn't do public capital budgeting ("The FBI building as another example of "I told you so"") and neither does DC ("Capital/civic asset planning, budgeting and management processes"). As a result, decisions are often short-sighted or wasteful, assets may be allowed to deteriorate over the long periods of time it takes to get a consensus on what to do, or scoring and other evaluation methods might be deficient in terms of providing useful guidance on priorities. Having a robust process for reviewing the status of our assets is another element of executing our responsibilities when we are in an environment where "we are all asset managers now." If we started thinking about and managing our public assets in this way, perhaps we would invest more and waste less, because we would be employing a longer term framework for decision making concerning investment and related public expenditures. 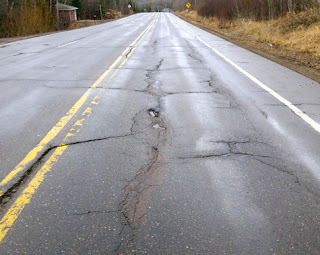 Note that some agencies are already doing this, transit agencies especially in terms of "state of good repair," because of programs that the Federal Transit Administration has developed for the nation's transit agencies. This slide is from the EPA presentation, "Environmental Management Systems and Asset Management," which addresses asset and risk management best practices for water utilities. Interesting quote: It also saves money by doing so. According to the Medicine Hat Community Housing Society, it costs $134,000 a year on average for the city’s emergency services to interact with a homeless person, but only $34,000 for supportive housing. Interesting article about Fayetteville, NC's siting of public buildings in a way that either contributes positively or negatively to "network effects" so that the sum of the buildings is greater in toto. Interesting article from the Norfolk Virginian-Pilot about Norfolk vs. Hampton Roads airports and the latter's decision to do a deal with a new airline, which later shut down, although the airport is still on the hook for some of the airline's debts. Norfolk reviewed the proposal, including having an outside consultant review it, and walked away. The airline was also pitting various cities/airports against each other in a bidding contest of escalating incentives. Federation Square in Victoria State, Melbourne. State plans to demolish an Aboriginal Arts Center in favor of a for profit Apple Store. In the UK, local government is mostly funded by the national government and over the past 10 years, budgets have been cut by up to 60%. What's particularly interesting about the prime example discussed in the article is that the supermarket property generating the rent is not located within the community of the council, but 200 miles away.